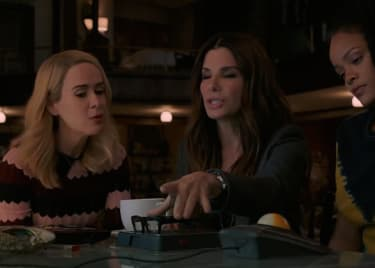 She’s played a journalist held captive in an evil asylum, a witch hellbent on becoming the supreme leader of her coven, the ghost of a drug addict who sews her victims into the mattresses of a haunted hotel — and now Sarah Paulson plays Sandra Bullock’s partner-in-crime in Ocean’s 8, opening on June 8. 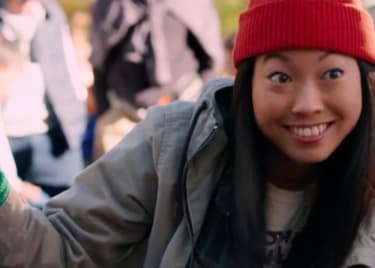 Although Paulson has garnered quite the reputation as the “final girl” of American Horror Story (the only one who makes it out alive in the end), she’s had quite the longstanding career. Here’s a list of five things you need to know about Sarah Paulson. Sarah Paulson got our attention in Deadwood in 2005 and has become well-known in the past few years, but she got her first agent as a sophomore in high school. In 1992, an eighteen-year-old Paulson got her first-ever acting gig as an understudy for lead actress Amy Ryan in The Sisters Rosensweig on Broadway, directed by Daniel Sullivan. Toward the end of the run, Ryan went to France, and Paulson actually went on as the lead for two weeks. Paulson landed her first TV role in 1994, on an episode of Law & Order where she played the grieving daughter of a wealthy publisher who died under mysterious circumstances. In 1997, she starred alongside Ernie Hudson as a pregnant teenager searching for her biological mother in the motion picture Levitation. Paulson first met American Horror Story and American Crime Story creator Ryan Murphy in 2004 on the set of his show Nip/Tuck. In 2008, they worked together on a pilot for a new show, which was unfortunately never picked up. It wasn’t until one fateful night in 2011 when Paulson ran into Murphy while accompanying Lange (who she met in 2005 while performing in a revival of the play The Glass Menagerie) at a dinner for Project Angel Food. At the time, Lange was filming Murder House, the first season of American Horror Story, and asked Ryan to “find something for Sarah to do on the show.” Ryan promptly offered her the part of psychic medium Billie Dean Howard (who aids Lange’s character throughout the latter part of the first season). The rest is history. In 2012, Paulson co-starred in the coming-of-age drama Mud as Mary Lee, the long-suffering mother of Ellis (Tye Sheridan), a 14-year-old boy who helps Matthew McConaughey’s character Mud escape from the police. The same year, she earned a Golden Globe nomination for Best supporting Actress in a Series, Miniseries, or Television film as White House Director of Communications Nicolle Wallace in the HBO political drama Game Change. Paulson starred in the Steve McQueen-directed period drama 12 Years a Slave (2013), in which she was praised for her performance as Mistress Mary Eps, the cruel wife to a sadistic slaveowner played by Michael Fassbender. The notorious scene stealer even had a supporting role in the Todd Haynes-directed romantic drama Carol (2015), as the best friend of Cate Blanchett’s character Carol. Not too shabby. In 2006, Paulson was nominated for a Golden Globe Award for Best Supporting Actress – Series, Miniseries or Television Film on the short-lived and mostly-forgotten Aaron Sorkin comedy Studio 60 on the Sunset Strip. Since joining the cast of American Horror Story, she received a Primetime Emmy nomination for Outstanding Actress in a Miniseries or Movie (both Lead and Supporting) for five consecutive seasons. Continuing her success with Ryan Murphy, Paulson won a both a Golden Globe and Emmy Award for her performance as prosecutor Marcia Clark in American Crime Story: The People Vs. O.J. Simpson. She even brought Marcia Clarke herself along as her date to the latter ceremony. In American Horror Story: Freak Show, Paulson took on the role of both Bette and Dot—conjoined twins with their own sideshow act. In the episode “Massacres and Matinees,” Paulson’s Dot delivered a sweet, folky cover of the Fiona Apple hit “Criminal.” While the actress insists she’s not much a singer, Paulson’s character sang on Studio 60 on the Sunset Strip, as well as in the 2013 stage revival of Talley’s Folly, as Sally Talley. 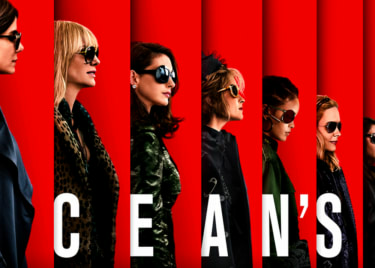 Catch Ocean’s 8 in theaters June 8th, 2018. 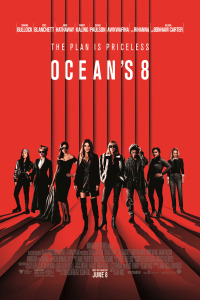 Anne HathawayCate BlanchettSandra BullockGary RossActionHeistSarah PaulsonOcean's 11Warner Bros.